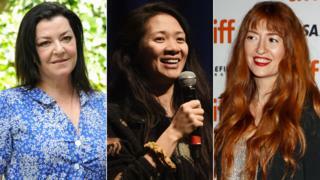 The Oscar nominations were announced on Tuesday, and there was a strong showing for films with women in lead roles. Both of this year’s most-nominated films – Roma and The Favourite – have female leads. But it was a different story in the best director category, where all the nominees were men. “It was an anticipated takeaway from this year’s Oscar nominations announcement, but that doesn’t make it any less unfortunate,” wrote Kristopher Tapley in Variety. The lack of women nominated for best director is “immensely disappointing”, Liz Tucker, chair of Women in Film and Television UK, tells BBC News. In the 91-year history of the Academy Awards, only five women have ever been nominated for best director. After this year’s nominations, some argued that female directors should be recognised – but only on merit, rather than for the sake of balance. “Can we stop focusing on gender and focus on talent instead?” asked one female Twitter user on Tuesday after the Oscar nominations. But Tucker argues: “It seems difficult to believe that, on merit, only five women have ever been in that best director category. “We’re not asking for special favours here… One’s not disputing the [best picture nominees] are all great films, but are they the best films? So why do so few women get nominated in the best director category? In Variety, Tapley suggested films directed by women don’t get the same promotional push from studios during awards season. And there is the fact that so few films are directed by women in the first place. Just four of the top 100 films at the US box office last year had female directors – A Wrinkle In Time (Ava DuVernay), The Spy Who Dumped Me (Susanna Fogel), I Feel Pretty (Abby Kohn) and Blockers (Kay Cannon). That’s fewer than in 2017, when women directed 8% of the top 100 films. “I think there’s still a sense that women are a safe pair of hands, but if you want to get that glittery stardust, you need to go to a male director,” Tucker says. Previously nominated for co-writing the screenplay for her 2010 feature Winter’s Bone, Granik could potentially have been recognised again for Leave No Trace. The film, about an Iraq war veteran (Ben Foster) determined to live “off the grid” with his teenage daughter (Thomasin McKenzie), proved popular with critics and currently has a 100% rating on Rotten Tomatoes. Granik did not want for high-profile supporters either. Jane Campion, one of only five women to ever be nominated for the best director Oscar, said last month that “she should be part of the best director Oscar conversation”. Traditionally, though, titles that launch at the Sundance Film Festival – as Leave No Trace did a year ago – tend to be forgotten by Academy members by the time they come to fill out their ballots. Another woman who would not have looked out of place on this year’s best director shortlist is Heller, the driving force behind darkly comic forgery drama Can You Ever Forgive Me? The 39-year-old Californian former actress made an eye-catching directorial debut in 2015 with coming-of-age drama The Diary of a Teenage Girl. Can You Ever Forgive Me?, her second feature, has three nominations in all – one for adapted screenplay, in which Heller did not have a hand, and another two for stars Melissa McCarthy and Richard E Grant. Yet Heller is unlikely to be ignored by the Academy for long. Her next film, a biopic of children’s TV host Fred Rogers starring two-time Oscar winner Tom Hanks, is already shaping up to be one of 2020’s leading awards contenders. Scottish film-maker Ramsay is up for a Bafta next month for You Were Never Really Here, a grim and violent thriller about another war veteran, played by Joaquin Phoenix, who tracks down missing girls. She is also in line for a best director prize at the Independent Spirit Awards, where her competition includes another two women – Tamara Jenkins and the aforementioned Debra Granik. As accomplished as You Were Never Really Here is, however, it may have simply proved too dark for Oscar voters. The film was Ramsay’s first project since Jane Got a Gun, a western starring Natalie Portman which she walked away from a day before shooting started. With two leading ladies boasting four past Oscar nominations between them, lavish production values and a pair of iconic queens at its centre, Mary Queen of Scots seemed to be destined for multiple Oscar nominations. Yet its only citations are in the costume design and make-up and hairstyling categories, with Saoirse Ronan and Margot Robbie both left out of the actress and supporting actress line-ups. Given Mary Queen of Scots is Josie Rourke’s film directing debut, it would have perhaps been optimistic to expect her to get a best director nomination right out of the gate. As The Favourite’s 10 nominations show, though, Academy members are partial to heightened royal melodrama – something that might have worked more in Rourke’s favour had she had the genre to herself this year. An outside bet for a best director nomination might have been 36-year-old Zhao, whose second feature The Rider has been quietly winning admirers since it made its debut at the 2017 Cannes Film Festival. The film arrived in US cinemas in April and went on to win best feature at the Gotham Independent Film Awards, one of the first ceremonies of the awards “season”. Beautifully photographed and boldly impressionistic, The Rider tells of a young cowboy, played by real-life rodeo rider Brady Jandreau, struggling to recover from a serious brain injury. Zhao might have not landed an Oscar nod, but she shouldn’t be too down-hearted. Her next project is The Eternals, a superhero ensemble adventure for Marvel Studios. ← Drop-off baby boxes: Can they help save lives in the US?